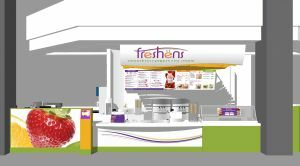 Freshëns will debut its newest mall store design in the landmark property, CambridgeSide Galleria in Cambridge, Massachusetts. “The new store is simple, sophisticated, and beyond today, with strategically placed focal points that create ‘stop-ability’ and consumer engagement,” says Paul Pizzini, director of design at Miller Zell, the company in charge of the Freshëns store design development. The remodeled 400-square-foot space at Cambridgeside Galleria is scheduled to open August 1. The location is owned by Allan MacQuarrie, a franchisee of Freshëns for more than 20 years. "I have just entered into another 10-year lease with even more excitement and anticipation,” MacQyarrie says.